Brief Synopsis – An aspiring boxer being trained by his brother and mother wonders whether he needs to make changes in order to get to the top. My Take on it – I must say that I have mixed feelings about this film. On the one hand, I find it quite an enjoyable one to watch but the fact that it focuses on Mickey Ward instead of his brother Dicky is a point of contention. Dicky’s story is a much more fascinating one to follow and Christian Bale does a superb job playing such a complex role. The story itself meanders a bit too much along the way which takes away from part of the impact of such a story. The cast is great all around with Mark Wahlberg doing a fine job in the lead. Bale won a Best Supporting Actor Oscar for this role and what’s most impressive is the way he physically transformed himself for this role between Batman stints. Melissa Leo also won an Oscar (Best Supporting Actress) for playing the mother of these two men. She does a fine job here, but I’m still not 100% convinced that she was the most deserving of the actresses nominated that year in that category. 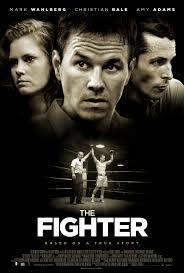 Not the best boxing movie ever made, but still done quite well. Bottom Line – Enjoyable story that works eventhough it meanders a bit too much along the way. The story of Ward is interesting but the story of his brother is even more fascinating and that to me is the part of this story that is more imapctful. Wahlberg is his usual self here but Bale really stands out and deservingly won an Oscar for Best Supporting Actor for this role. Leo is fine as their mother and does a fine job in the role. She also won an Oscar for the role but I’m still not convinced that this was the best supporting actress performance of that year. Recommended! Genre Grandeur Worthy? – Not really. It’s an enjoyable film, but not among the best in its own weight class. I was in two minds about Bale in this one. I sometimes got the feeling he was overacting a bit.